Ravenclaws, you are up! Whether you're a quirky one or a super bookworm, or a little of both, I have you covered! As I mentioned in my previous posts, I tried to find things that not only represented house pride, but also things that the people in the houses would actually enjoy. So let's get into it! The most famous piece of Ravenclaw history is the lost diadem, which as an extra added bonus happens to be absolutely gorgeous! This comes with a collector's case for display purposes when you're not rocking it on the regular. If you aren't really looking to spend the money on the actual replica, you can always get it in necklace form. Ravenclaws are always thinking, right? Always coming up with great ideas or just deep reflections. So it's only right for them to have a fancy notebook to keep all of these thoughts and ideas in. There are a lot of gorgeous notebook options, but this one is by far my favorite. It's very clean and classic looking, plus it will hold up well with its faux-leather cover. I always think of Ravenclaws as the classiest, most dignified house in Hogwarts, which is why I think this is a perfect fit for a Ravenclaw. If you get a letter with a real wax seal on it it's pretty darn special. Plus this looks gorgeous. Granted, it is the movie colors and not the book colors, but it's still pretty cool. When you're on the go, there's nothing better than a smart bag to carry your tablet, books and all of your other belongings. Enter this really pretty messenger bag! You can take all of your reading and writing with you wherever you go! Where is the absolute best place to be alone with your thoughts? The bathroom. Or a nice hot shower. Either way, you can definitely enjoy this spa kit! The set includes lotion, bubble bath, bath salt, a soy candle, soap and a tube of lip balm, most of which smells like Butterbeer! Perfection in a little kit. This is the easiest way to get your relaxation on! One thing any bookworm loves is a nice set of books. This is one of my favorite set of Harry Potter books out there. You can get a set for each house and they are all beautiful. They come in a box to protect their gorgeousness as well. Just in case you don't want to keep them out on display. Because these probably wouldn't be for reading anyway. They're too pretty! Who doesn't love a good puzzle? And who doesn't love a good puzzle that turns into Hogwarts? This undoubtedly will be a pretty big challenge, but imagine how amazing it will feel to have it done! And how awesome it will look on display. What is worse than people trying to talk to you while you're reading? Nothing. Nothing is worse than that. But you can absolutely let people know that you don't want to be interruted by wearing a shirt telling people as much. Or that you love to read. Or that reading with your cats is your favorite. Whatever your voice, let it be heard with this range of shirts! It's said that the Ravenclaw Common Room's carpet is covered in stars. Plus they're up in their own tower, so I can only imagine how beautiful the stars must be from the windows. I could stargaze all night! Bring these celestial vibes into your wardrobe! Like this starry dress, this moon and stars cardigan, this moon choker, or these earrings. Room To Read is an organization that aims to "transform the lives of children in developing countries by focusing on literacy and gender equality in education". One of the primary goals of this organization is to help make sure that girls continue their education. In developing countries, the education of boys is valued higher than that of girls, but girls have every right to an equal education. They work directly within the various communities to make sure that this happens. They have already benefited 10 million children, which is amazing! Just one donation of $50 teaches one child to read and write for a whole year. Next week we will be finishing up this Very Merry Harry Potter Christmas with the Gryffindor gift guide! Hopefully you'll have enough time to grab some gifts for your Hogwarts friends before Christmas comes. 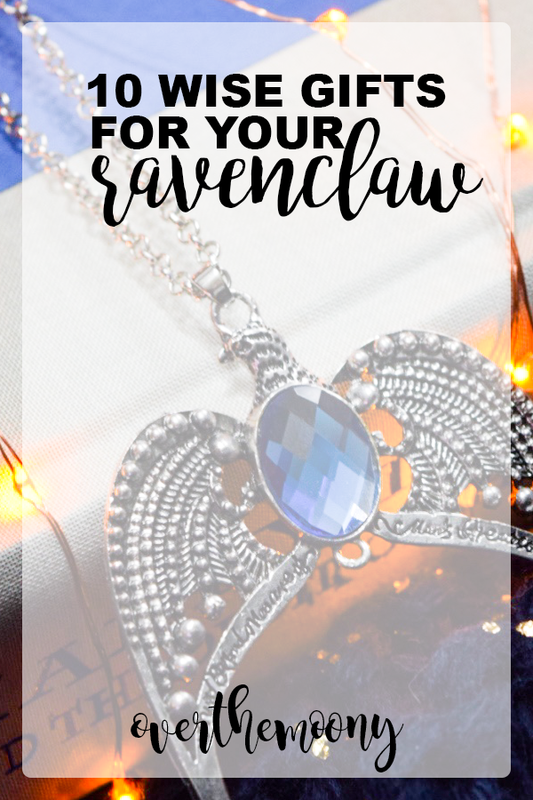 Let us know if you have any other Ravenclaw gift ideas in the comments below.